The Travelon RFID Blocking Leather ID and Card Holder protect your identity and carry your RFID enabled credit and debit cards securely with this RFID blocking leather id and card holder from travelon. It features 2 stacked card slots and an id window on one side and card slot on the other. The zip pouch is perfect for tucking away a few bills and a lipstick. 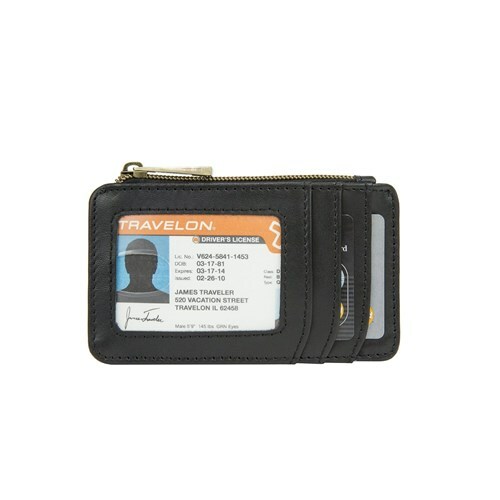 The Travelon RFID Blocking Leather ID and Card Holder-Black has many exciting features for users of all types. You can extend the lifetime of your Travelon RFID Blocking Leather ID and Card Holder-Black with the purchase of a FactoryOutletStore Factory Protection Plan. 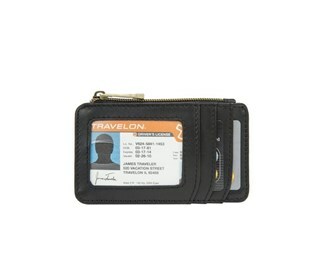 The Travelon RFID Blocking Leather ID and Card Holder-Black is sold as a Brand New Unopened Item.